I've found what appears to be a minor bug in El Cap's spelling autocorrection mechanism, however your feedback mechanism doesn't allow for enough characters to describe it. Here it is instead. When the text insertion cursor is placed in a string of letters at a position in the string such that the letters to the left of the cursor constitute what spellcheck considers to be a misspelled but correctable word, it will not give the user warning. However, if a space is then inserted, the correction will be made, unannounced. Place the text insert cursor just after the "d" at the end of "change-password"
Backspace 15 characters leftwards across all of "change-password"
Type out the 6 characters of “passwd"
Place the text insert point just before the “c” at the start of “command"
Backspace 16 characters leftwards across all of "change-password "
The lack of visual warning in Method #2 step 4 is a bug. 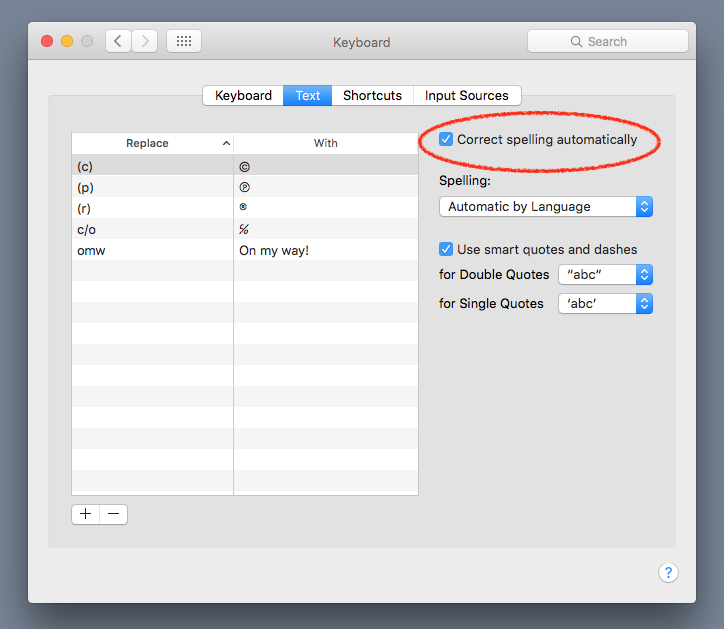 Fellow users, if the above bothers you as it does me, turning off autocorrection completely can be done in System Preferences->Keyboard->Text by unchecking the Correct spelling automatically box. 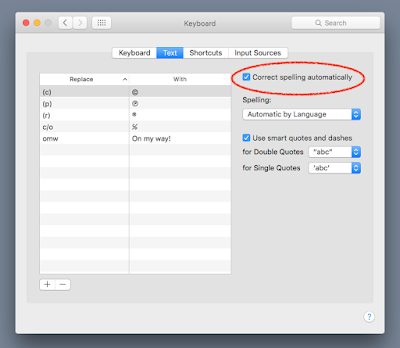 To turn off autocorrection more selectively, for selected applications, see here. Today's date is not necessarily the best on which to make any kind of announcement, and it's true that the complexity of growing an international business from a standing start can often feel like an April's Fool joke, especially when I consider all the silly government-induced things we need to put up with. 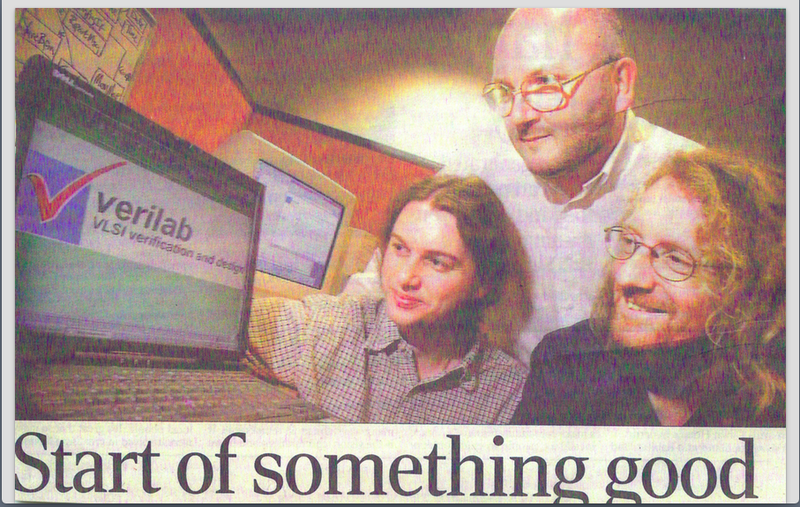 But it's true; Verilab is fifteen years old today! Mark, Jason and I started in Scotland on this same date in 2000, about a week before NASDAQ peaked and then began its heady fall. (Sorry world, we never meant to burst the bubble.) A year or so later, we opened an office in Germany, and then around 2004 we arrived in Texas. Today we have people in those places, but also in: England, Oregon, Washington, Ottawa, and Quebec. The number of states and countries in which we serve clients is at least double that. Overall, across many hundreds of projects, we have seen all the very best (and not-so-very-best) in the development of advanced silicon system. In fact, I think it's likely that in Verilab there lives the single most concentrated collection of tool-independent chip verification expertise anywhere on the planet. In pursuit of the goal of helping clients to "tape-out" as quickly and as safely as possible, if we haven't seen it, it probably doesn't exist. Well done and thank-you to all the team, our illustrious alumni, our many-splendored clients and partners, and of course our significant and long-suffering others. Happy Birthday to Us! Just got back from a bunch of us from Verilab making our annual Journey to the West, to attend DVCon, one of the main conferences for our field. Wrap-up here. Numbers and numerical analysis aren't my favourite part of running a business, but they're not far off it. I wrote the following as a reminder, advice to a young entrepreneur if you will, of the importance of getting to know your numbers. Based, of course, on Major General William H. Rupertus's famous lines. These are my numbers. There are many like them, but these are mine. My numbers are among my best friends. They are part of my life. My numbers, without me, are useless. Without my numbers, I am useless. I must keep my numbers true. I must use them to turn confusion into clarity, and complexity into simplicity. I must overcome complexity before it overcomes me. My numbers and I know that what counts in business is not the calls we make, nor the noise and smoke of our marketing. We know that it is the value delivered to customers that counts. We will deliver value. My numbers are human, even as I, because they are part of my life. Thus, I will learn them as a soul-mate. I will learn their weaknesses, their strengths, their parts, their deeper levels, their ratios, their essence. I will keep my numbers precise and ready, even as I am ready and diligent. We will become part of each other. My numbers and I are the defenders of my team and my company. We are the masters of our field. We are the heart of success. Digging around some old emails I came across an interview I did a few years ago for Hi-Tech Scotland Magazine (now defunct apparently -- hope it wasn't my interview that killed them!) Thought I'd post it here, with a few editorial updates where needed. It's in the typical question and answer format. HTS: Describe your current role. TK: I'm the overall manager of Verilab. For the UK parent, that's the Managing Director. For our German subsidiary, Verilab GmbH, I'm the awesome-sounding Geschäftsführer. And I'm CEO for the US subsidiary, Verilab Inc. In fact though, all three company entities form one team and I run that from Austin, TX. [Ed: we now also have Canadian teams in Ottawa and Montreal, under the fourth in the group, Verilab Canada Inc.] In theory, the most important part of my role is really, at the risk of sounding pompous, "Keeper of the Vision". My team work on very tough technical problems across Europe and the US, in projects that are often rapidly approaching key market windows and so are short on time and high on pressure. My job is, in the midst of all that stramash, to keep in all our minds what we formed Verilab for - to be the "McKinsey of VLSI engineering". In practice though, I do what all small-firm CEOs do - anything and everything that needs done. Because we're a services firm, we bump into lots of government rules and regulations. I deal with those. I plan and monitor financial performance. I am constantly building and developing the operational infrastructure - HR, Engineering, IT, and so on - to allow us to continue to grow. And so on. It's busy! HTS: When did you first become interested in technology as a career? TK: Well, when I was three, I'm told I was hauled off a chair while trying to "fix" the Christmas tree lights with a screwdriver. And in primary five [Ed: US 4th grade] I announced that my ideal career was "Quantum Mechanic". Basically, I've always been interested in technology. I did hover between pure science and engineering for a while, and still harbour a secret desire to do physics. But as soon as I discovered microelectronics, I was so fascinated by those wee black packages on green circuit boards, I decided that's what I'd be working on. HTS: Broadly speaking, from your own perspective, what sorts of technologies are likely to prove important over the next 10 years? TK: Anything to do with communication - hardware and software. Every time I fly, I'm frustrated that I can't use my cellphone or connect to the internet. That's going to change. [Ed: Done!] I now have GPS in my cars, but it's annoying that they aren't linked to something like Google maps, or updated in real time. That's going to change. [Ed: Done!] My company has people at clients from California, through Texas, to Edinburgh, and on to Dresden. Despite all the current technology, I still can't get easy-to-setup, high def video conferencing with my teams, from& wherever each person is. That's going to change too. [Ed: Still not done :-( Come on video people: I have pain, I have budget, I am the decision-maker. Give me a call!] I believe that the difference between what I knew as IT as a kid (the build-it-yourself ZX-81), and what I see today, is just a small fraction of the difference between what the kids of today are seeing and what they will see in thirty years. Even the next ten is going to be awesome. And a huge part of that difference will be not from increased computationper se, but from increased communication. HTS: Was it always your ambition to work overseas? HTS: Has being Scottish ever been an advantage (or disadvantage) to you elsewhere in the world? TK: It's been both. In general, being Scottish - or, more precisely, having a Scottish accent - is a big plus. People often go all sentimental when they hear my accent and say something like "Ye know,ah'm from Sca'lun' too. Ye ken?" Which typically means, their great-great-great-granny came from Dumbarton via Ellis Island. Also, Scotland is one of those places that everyone would just love to visit. So being a native Scot carries a lot of kudos. The downside though is, as a thoroughbred Scot, having been born and brought up just outside Paisley, I think I carry some of what Carol Craig described in "The Scots' Crisis of Confidence". There's something about having lived and breathed the cauld rainy air for 40 some years, and having absorbed a culture that sees any display of wealth as ostentatious, that runs deep in a person and is hard to shake. Even today, having grown Verilab to an elite international consultancy of increasingly high reputation, there's still sometimes a wee voice inside that can say, "Here you, don't get too big heided". HTS: Do you have any remaining ambitions? TK: To really understand Wittgenstein's Tractatus Logico-Philosophicus.